Every first draft is perfect because all a first draft has to do is exist. Mom said the word, “Thank God!” about this quote. In her 12×12 in 2014 challenge, Mom writes a new first draft every month. So far she is keeping up, staying ahead, and getting it done. 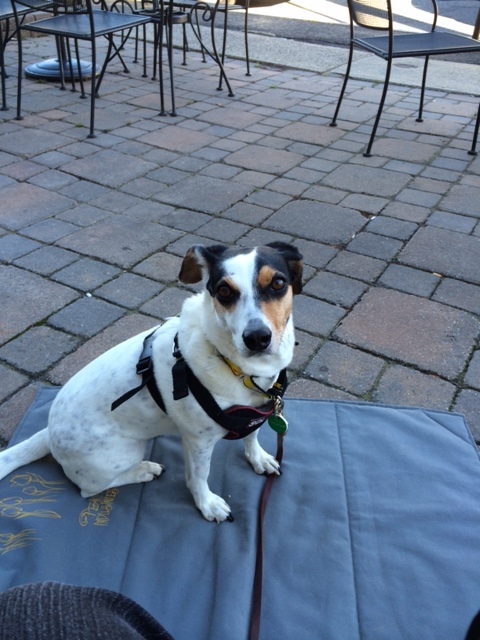 Recently, Mom took me to the bagel cafe to have breakfast at the outdoor patio. Last summer, we tried this, but I went berserk. 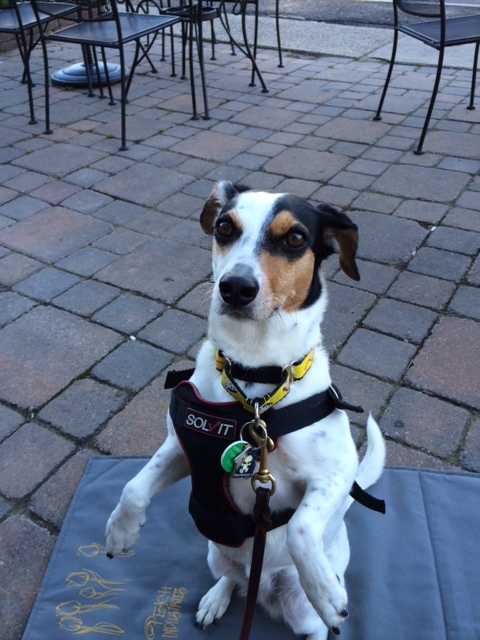 I kept trying to pull Mom’s arm out of the socket and kiss the waitress, I was afraid of a motorcycle zooming past and people window shopping across the street, and instead of drinking from the water dish they gave me, I sat in it. This time, I was better. 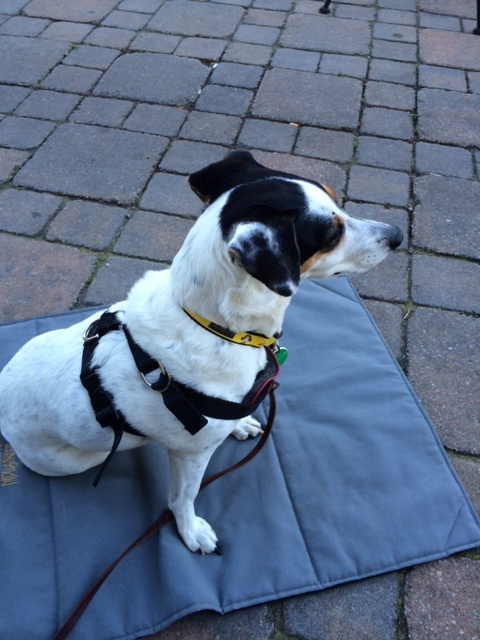 I sat on my Park It Mat, watched people and cars go by, and didn’t beg…. Are you going to finish that….? Excellent job Cupcake! Now tell mom that the next step it to order you a pupacino and bagel of your own. Brilliant, W. and S. Pupacino is exactly what I need! I’m sure it won’t make me hyper…. Good luck, S. The harness is a tough nut to crack. Thanks, E. I had a few bites of egg, but I really wanted a whole bagel for myself. I think the ParkIt Mat has a new site – http://www.peachindustries.com/park-it-mat Whenever you sit on it, you will get cereal. What fun! I hope you got your OWN bagel? If not, that one you’re eyeing in the last photo looks nommy! Looks to me like you were a VERY good girl and you deserved a treat! My Mom says “first drafts” aren’t called simply “drafts” because “first” means there will probably be MANY more to come (eeeek!). Good for your Mom!! Thanks, S. Your mom knows the ins and outs of writing! Mom talks to her drafts a lot. 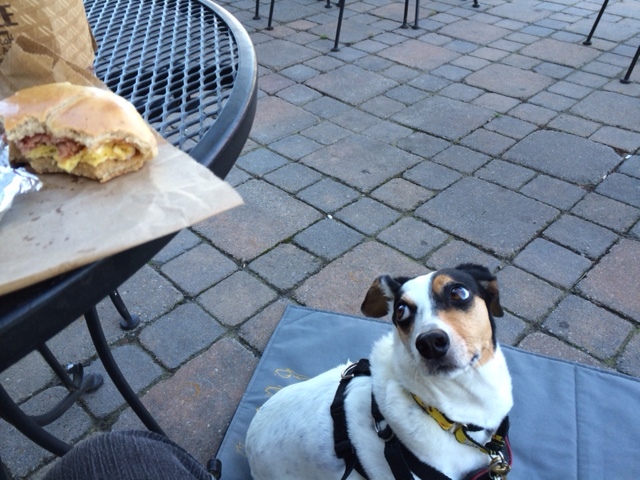 I wanted that whole bagel sandwich, of course, but I only got a few bites and some corn flakes from my treat pouch. …maybe next time. that is furteck. I am glad you are getting more relaxed. I have my own binkie when we go read. The binkie can be very soothing, F. Mom brings my ParkIt Mat when we go read. Thanks, FM. Quality control… YES! That’s all it was. I wasn’t thinking about losing my mind and making a leap for it…. Look at your ‘are you done yet?’ face it’s brilliant!! Waiting is tough, B. I knew there was something up there for me! I hope it was worth the wait?! Awww Cupcake, sweetie, I get all confused in public with lots of people around too and I am a human. CH, the Husband, says he can’t take me anywhere.. 🙂 Congrats on the “Good Job”! Thanks, Pix. People and cars and motorcycles and birds and FOOD! How much could I take?? Well done, Cupcake! You’ve made a lot of progress. Thanks, B. Mom did share a little, and she gave me some treats while I was being a good girl. Sometime, I would like to get a whole bagel sandwich for myself. Love that quote. Easy peasy, right? Then comes the hard work but mom’s got it in her. Thanks, G. For some reason, Mom didn’t take her eyes off my sandwich…I mean her sandwich. She for sure likes writing first drafts and dreads revising them 5,000 times. But that’s her work. BONE appetite to you, too! Well done Cupcake, you are a star! Thanks, M. I think I WAS a star at the bagel shop. Lots of people petted me and said I was a good girl. Some call it begging, others call it “dining entertainment.” I’m sure it was just for the ambiance. Thanks, W. I am a HUGE help in the ambiance department wherever I go. Thanks, J. What I DIDN’T have in me was my own bagel sandwich. Oh well. Maybe next time…. You deserve ALL of that fur being so GOOD. Just sayin, Cupcake. Thanks, F. and E. I thought so, too. Mom said the word, “Dream on.” I think that means yes…. Thanks, K. Mom taught me to stay on the mat by giving me corn flakes. Sometimes, I still lose my mind and leap off the mat to see what’s up. Apparently, that if NOT good behavior. Love your self-discipline. Great photos Cupcake — the last one is especially expressive. I’m glad you can read my face in that last shot, P. Mom didn’t get the message….. Thanks, C. That’s about right. I just got a crumb or two…. I wanted 500 crumbs, but no luck. He is sooooo sweet ! Brilliant, Cupcake! I hope your mom’s works will also show such a steep learning curve and become perfect right on the second try! But why are you not allowed to kiss the waitress? I’m sure she would be very happy about it, too! Thanks, K. I think you are right. Who doesn’t love a wet, slobbery dog kiss while they’re carrying plates of food? Go figure. It is cool, HC. But “no psycho behavior” only sitting nicely on the Mat. It’s a rule. Mommy loves that quote. She thinks that some days are first drafts. 🙂 You were so excellently well behaved on your breakfast outing, although I think the waitress might have missed being ambushed with Cupcake kisses . . . maybe. Have a great day! I thought so, too, Miss HL. I feel it’s my duty to give kisses to everybody I can reach. I hope you got some of that bagel! I got a few tiny tastes, M. Because of being so good and all…. Good Job, Cupcake! I don’t think Fuzzy and I could have done as well! Thanks, L. I am getting better at learning. yay for outdoor cafes and park it mats and next times. Especially next times. So true, R. Without next times, I just don’t know where I would’ve ended up! My whole life is about second chances. Thanks, Little B. I learned about how to “park it” by eating cornflakes on my mat. Over and over and over and over…..
Good job Cupcake! That food does look dewishus toowooowoooooooooooo! Thanks, K. It WAS delicious. I got a few tiny tastes.